“What are they thinking about me? The question goes through your mind again and again, sometimes in the forefront and sometime as a nagging whisper in the back of your thoughts. 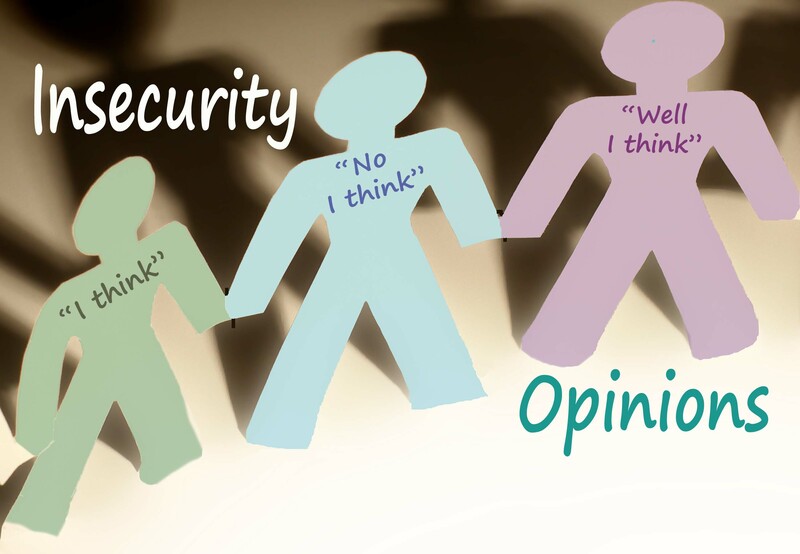 The insecurity of others opinions returns to rock our security again. This is my second blog post on the subject of insecurity and how many of our insecurities come from both comparing ourselves to others and listening to and speculating about others opinions of us. I know in my own life these are the two main issues that can leave me feeling like I want to hide under a rock, shut myself away from the world and never come out. It’s these two issues that can end up consuming our thoughts, feed our anxieties and stop us in our tracks. Even people who act like and say “I don’t care what other people think about me,” whilst holding on to their mastered, controlled and perhaps hardened exterior, cannot deny that it does reach, touch & affect them at times. Firstly, when people openly talk about us, either to our faces, or indirectly on forums like social media. Secondly the usual gossipy ‘behind our backs’ opinions. (which women are of course very prone to). Then finally, although sometimes less discernible; through our own speculation about what others might be thinking and saying about us. I think it’s the final one that is more damaging than it first appears, because our speculation means that we try and read people by the way they act towards us. This actually opens us up to potential misunderstandings because we read actions as related to us, even though they may just be related to someone having a bad day, their mind being on on other things or even due to that persons own insecurities. How many friendships and relationships have broken down due to these type of misunderstandings? This speculation is one of the greatest challenges I have to overcome in my own thought life. It constantly nags at me trying to pull me in to an insecure way of thinking. It attempts to stop me being myself and doing what I am built to do. It tries to shipwreck my relationships with others. It questions my identity and challenges the core of who I am. It whispers in my ear…. Tell me that those thoughts are not enough to make you want to hide away under a rock, out of sight and not face anyone. People can be nasty and we know it! We have all experienced it and have all done it. 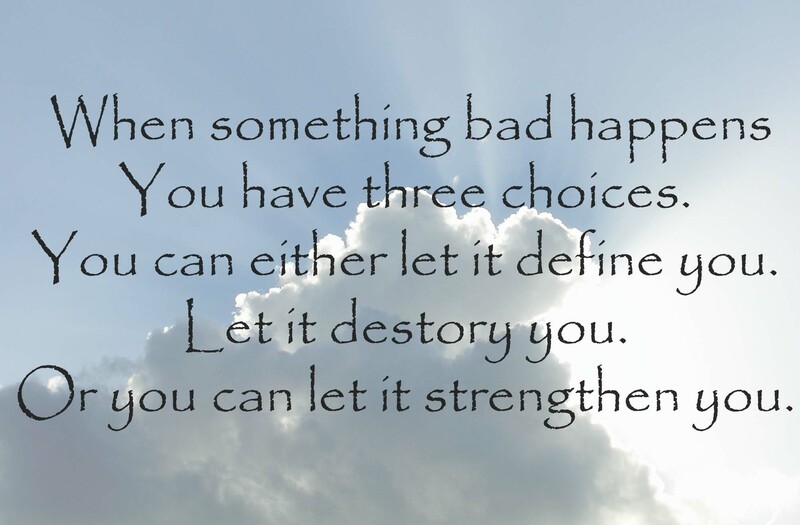 Especially if we are having a bad day or two, and if we have had a bad week – oh dear! It’s enough to make anyone cynical & even fearful of others. It’s not surprising that we feel insecure. 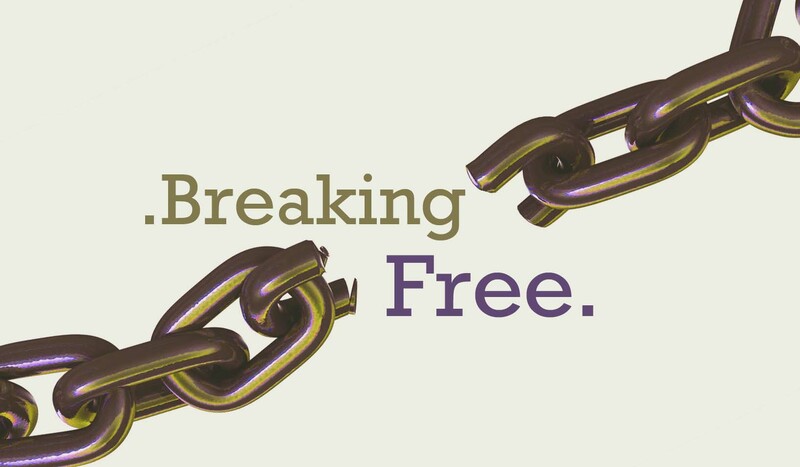 So how do we battle through the insecurity and find more freedom in our thoughts? As I have already said I still don’t find this easy myself. I daily take on the challenge to reign in my insecure thoughts. Some days it’s easier than others. But I have found some keys to freedom and they really help. The best way I have learnt to overcome my own insecurities about what others are thinking about me is by choosing to relate to other people with GRACE. Now grace is one of those words we often either relate to girls names, meal time prayers or religion. But grace is actually an amazing concept. Grace basically means something described as ‘unmerited favour’. In the context of relationships I would put it like this: it’s not relating to others in response to what they think, say, act or what you get back. It’s choosing to treat people well regardless. In the context of faith; it’s loving people whether or not they deserve it. And yes…. it’s a radical concept! Well I only find it possible because I know that’s how I am treated. I know that God loves me regardless of what I do. He does not love me because of how good I am (that wouldn’t get me very far anyway because I miss the mark all the time). He loves me by grace and to understand that is so freeing. I no longer have to try and get everything right to get God to love me. He just does and nothing can change that unconditional love. So from the security of knowing I am loved unconditionally by someone unchanging, I have found I can choose to offer it out to others. 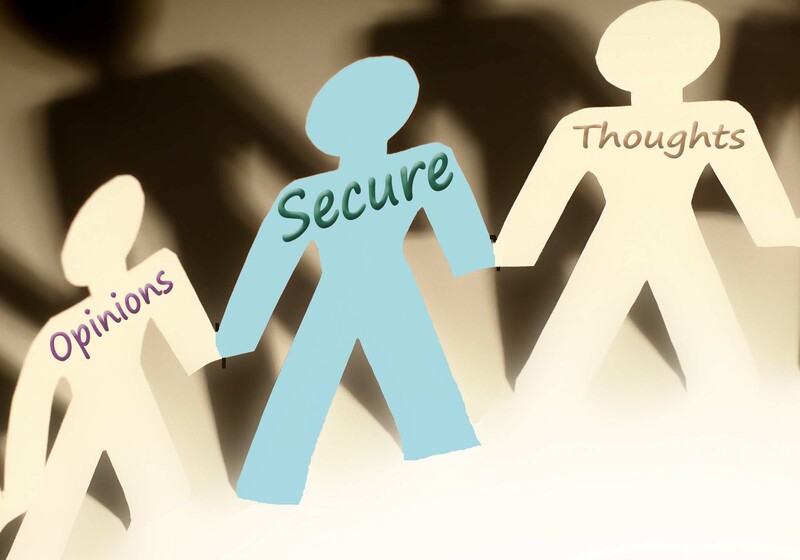 I can build relationships with others from a secure place. I do not need the other person to like, love or think highly of me to feel secure in myself, because I know that my security ultimately comes from God. When you have to try and work out whether or not someone deserves your love or friendship you start down a confusing and rocky path. The outlook is changeable because one day they do and the next they don’t, which is why so many people have turbulent relationships. If you no longer have to go through that process and you choose to approach all your relationships and those around you with grace; you decide to love others regardless. And it is so freeing! The challenge is that it takes a lot of humility. Which is why we have the battle in our minds & thoughts. We get angry, hurt and offended and our anger can often be rooted in our pride. We shut people out because we fear them getting close and hurting us. We get offended because the other person said or did something that we didn’t like. So we retaliate with criticism and even hate. I am going to choose to love this person regardless of what I get back. It puts the other person first. It chooses to try and understand rather than misunderstand. I gives people the benefit of the doubt. It knows that everyone is fighting their own battles. It does not stereotype, but sees everyone as worthy of love. This doesn’t mean I want to spend and invest my time with people who have taken a dislike to me or want to hurt me. But it does mean that I can reach out a hand of kindness and friendship to others, regardless of how they respond. And if they choose not to like me that is up to them – you can only build a relationship when two people both want to invest in it. So if this is the case, I have to let it go, I do not need to hate them or get them back for their dislike of me. It does not need to eat away at me until bitterness takes hold of my heart and I end up taking my anger out on everyone else, including those who love me. Instead, I can rest in the security that I am loved. With a perfect love from the author of love. A love that is consistent, unfailing, stable and unconditional. That security always overrides the insecurity that come from others opinions. Yes I still may have to face and overcome the hurt, the pain and embrace my vulnerability and fragility. A place that is constant. Where I know who I am. Where I am again built up. Where encouragement gives me the courage to get back up. To face the world around me. Not to be rocked back and forth by the opinions of others. A place where I realise that others opinions are just that – opinions; that often say more about them than me. Where I can stop being tossed about by the waves of speculation and instead be secure and anchored in the fact that other peoples opinions should never define me or stop me from being the person I really am. The person that is truly me. I don’t know about you but when I compare myself to others I often end up feeling miserable. As the above quote says, it steals away my contentment, happiness and peace and yet it’s so easy to do. Sometimes we don’t even realise that we are doing it. 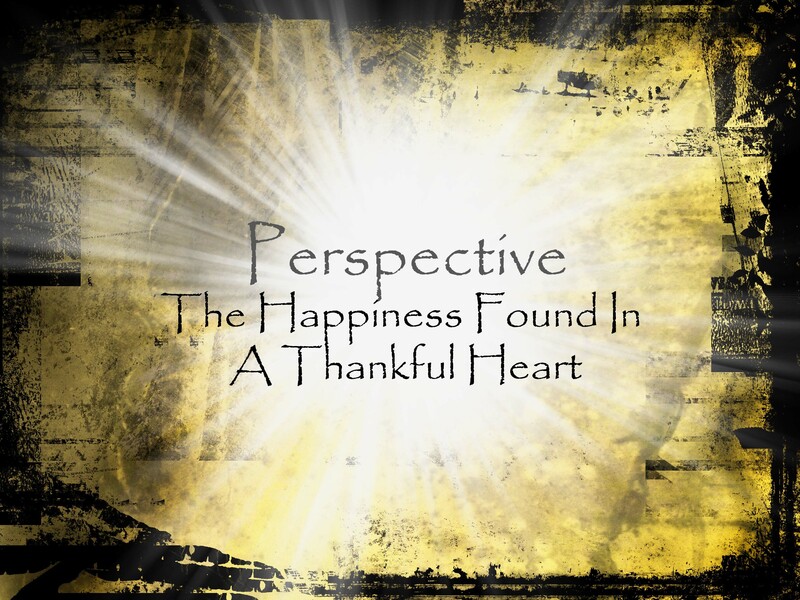 I mentioned the quote in my last blog post about perspective and the importance of thankfulness. At the time I decided that I wanted to expand on this point about comparison and jealousy because I know from personal experience that it’s one of the biggest challenges that I and many people I know face. If we are honest we all struggle with comparing ourselves to others in so many different ways. We see photos of others and instead of just thinking – “wow they look great!” We can often think – “they look great …. how annoying”!! (Because it automatically reminds me that I’m feeling pretty ugly/ fat/ rubbish/ insecure today). Or maybe we see someone else’s achievements at work, school or within our friendship or family groups. But rather than being able to authentically celebrate it with them – instead it reminds us of our own weaknesses and failures (which can even cause us to lash out at others instead – both directly or indirectly). Parents do this all the time. Someone else seems to be the perfect parent with perfect children (not that there really is such a thing) and we just end up feeling rubbish about our parenting skills rather than seeing what we do well. Leaders do it. We look at a similar company, organisation, community group or church and rather than seeing & celebrating their strengths we instead find that their strengths reveal our own weaknesses & feelings of inadequacy. (Although we can hide that by instead looking for all their weaknesses to justify our own!). Why is it that others’ successes often remind us of our failures? Most of us have an inward default that compares our weaknesses with another’s strengths. For instance, I can remember in my early teens one of the boys in my class at school made a comment about my nose. His words were something like, “Ha ha, your nose looks like a beak” and kept calling me Pingu (his observational skills sound quite amusing as I write that down & I think I laughed along at the time – as you do.) But before that day I had never really thought much about my nose. It all changed that day. For a long while after that I was so conscious of my nose. I examined it’s shape in the mirror constantly, wondering how much better I would look with a nicer, smaller, better proportioned nose. Most significantly, from that point on I noticed everyone else’s noses. I compared my ‘beak’ with the girls with the perfectly shaped little noses. The initial comment from that boy about my ‘beak’ drew my attention to my nose. But it was then my comparison with others’ noses which solidified my insecurity. We do this all the time and it causes so many problems in families, relationships, communities, schools and workplaces. 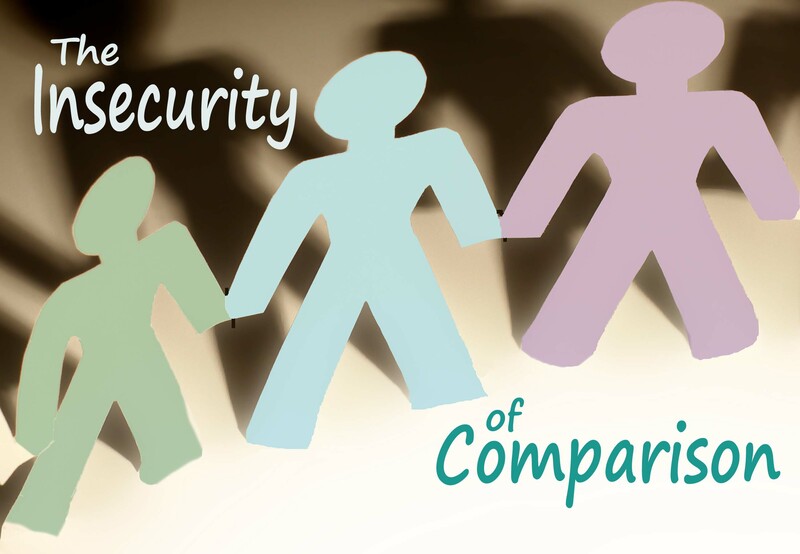 Comparison is an epidemic which has markedly worsened by the rise of social media. I appreciate so many of the positives of social media, which is why I use it. But I don’t think anyone can deny it has made comparison and jealousy worse. When I was at school, as many others can relate to, I would constantly compare myself to all the popular, pretty and super clever girls. I’d wonder which of my friends really were my friends, who did or didn’t like me (and who said what behind your back), which (if any) boys did, or more usually didn’t, fancy me and of course face all the daily challenges of school life…… but at least then I could get some sort of respite from that at home. Now comparison comes right into the home. It is carried around in your pocket & draws you in when you scroll through your social media, websites and the abundant pictures and information on your smart phone about others. Taken directly from the playground, workplace, community and moved into peoples homes and lives through the internet. No wonder depression, self harm, eating disorders & even suicide seem to be on the rise. Especially in young people. And we can come away feeling rubbish. And subsequently we can end up despising those people. Attempting to find cracks in their perceived ‘perfection’. Competing in our minds and actions. Whilst slipping further into insecurity. Jealousy raises it’s ugly head but we don’t always see or perceive it for what it is. Jealousy and comparison are often so apparent with siblings. I see it all the time with my two girls (and remember it from growing up with my two sisters). It causes so many of the fights between them. A lot of their battles stem from competitiveness, comparison or jealousy. But they often can’t see it themselves. Why does she get to have or do that. And it’s always the other ones fault! They cannot see that often the problem is often not the other person. It’s those feelings that make them feel angry. It’s those feelings that make them lash out. That they themselves are a big part of their own problem. That it takes two to have an argument. The problem is often not really about the other person; it’s often really about us and how we feel. We blame other people for our own feelings and insecurities, often without justification. Yes, other people can hurt us, attack us, be nasty, be difficult, treat us unfairly. But we can rarely change them by fighting back. Actually, fighting back often destroys us more than it does them. We cannot control others’ feelings but we can manage our own feelings and emotions and learn to not let what others do or think dictate how we feel. I truly believe we can begin to get free from many of the negative effects of comparison and jealousy if we choose to. 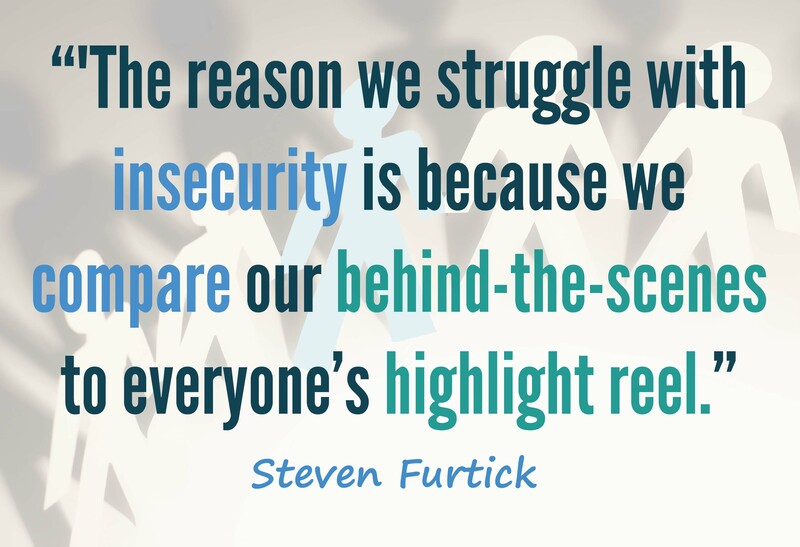 We need to become more aware of ourselves and what drives our insecurities. To begin to recognise that what we really feel is jealousy when comparison draws out our insecurities. To realise that we cannot make other people change but that we can only change ourselves and our own attitudes. It’s only as I become more self aware and recognise comparison and jealousy as the source of many of my insecurities that I can begin to get free from its entanglement. It’s only as I realise that when I feel insecure it’s not the other person that made me feel like that – but instead my own reactions to them – that I can move beyond my feelings. The first step to personal freedom is always self awareness. Rather than getting frustrated and lashing out at people that make us feel insecure, we must see that most of the problem lies within us. It lies within our own perception of who we really are. It’s not easy to stop feelings & thoughts of comparison and jealousy. But it is one of the keys to true freedom. It’s a battle worth fighting. So how do we fight this never ending battle? By becoming secure in our own uniqueness. Not to be constantly compared to others but to be discovered & developed as unique and valuable. To try & be anyone else is far too exhausting. It’s not an easy path to tread. I have chosen to walk this path but still find I have to daily overcome the temptation to compare who I am and what I do with others. But it’s a path worth taking because it’s the only way to true freedom, contentment and inner peace. 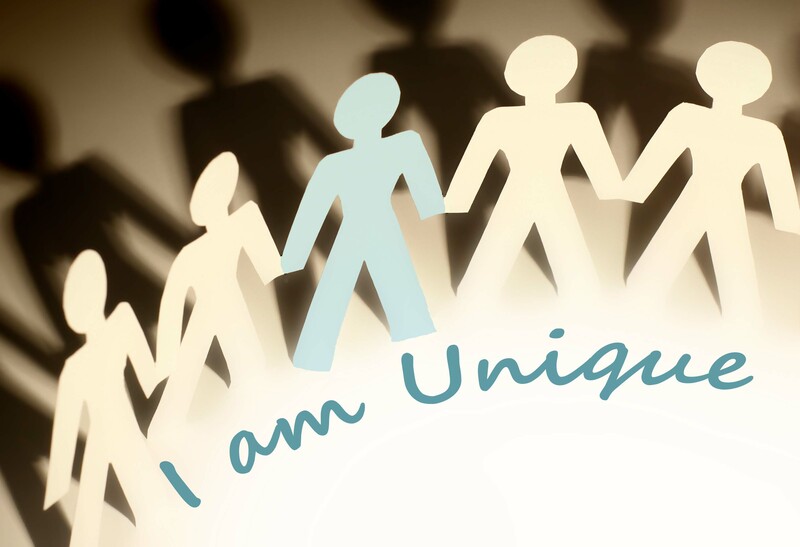 So in this moment I choose to remind myself that I am who I am, a one off, unique, not to be compared with others. Pressing on to become the best version of ME I can be, whilst allowing YOU to be the best version of you that you can be. That way we allow ourselves and one another to discover more freedom. ….. Because I don’t know about you but comparison and jealousy are just not worth it! They just always make me feel miserable! I press on to become the best version of ME I can be, whilst allowing YOU to be the best version of you that you can be. That way we allow ourselves and one another to discover more freedom. This is the first of two posts on Insecurity. The second post, which I published a week later is The Insecurity of Other Opinions. Often it’s not until a traumatic change takes place in our lives that we really value the normality of our everyday lives… It’s all linked to perspective. 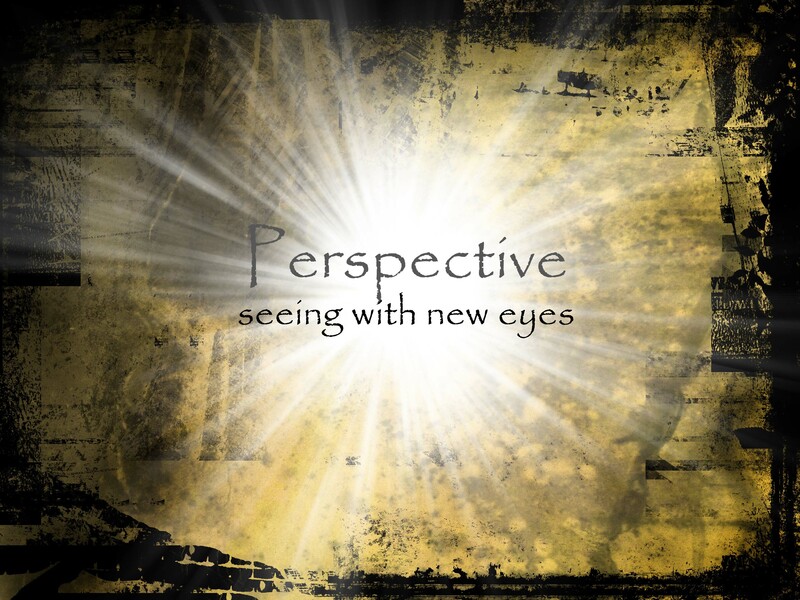 Three months ago I wrote the above words in my first blog post on perspective. How true those words were in the season ahead. For about 12 weeks our family’s normality was snatched from us and we lived out a new normality that involved coping with injury, illness and a massive change in our day to day lives. It’s now 3 months since I sustained a brain & spinal fluid injury and at last I feel pretty much normal. I finally feel like I am getting my life back. I still get a bit more tired than I would have done pre-injury and experience some other milder symptoms if I do too much, but I can finally begin to move on in my life and put the injury behind me. ‘Normality’ never felt so good!! To be able to function pretty well in everyday life feels like such a blessing. I am so thankful for health, energy, family & friendship. Before my injury I could at times take these things for granted but through my injury I have suddenly become so much more thankful for them. The last three months adjusted my perspective. Sometimes it’s not until your normality is taken away that you really do appreciate it. This week my husband was away with work and the kids were on school holidays. I was so thankful to be able to look after the kids properly and get on with life with Matt not being here – something I could not do for 12 weeks. I have also been able to get the calendar out and make plans for the future. It feels great! It’s made me think a lot about thankfulness and how it is so often linked to our perspective. If we take things and people for granted – we will no longer feel grateful for them. If we dwell on the negatives of our lives – we will no longer see and be thankful all the positives. If we feel entitled to something or someone’s attention – we will see it as a right rather than a blessing. Thankfulness can be life changing for BOTH those who give and those who receive it. This is because when it is heartfelt it comes from a place of humility. To say thank you and truly mean it is a small act of generosity and appreciation and – although small – can be powerful. But if gratitude is so important why is it sometimes so difficult to maintain? I often see within myself and those around me how quickly we can slip into an ungrateful perspective. It can happen subtly at first, but often gains momentum, as we compare our lives and situation to others. When we measure our lives against our perception of others’ lives (which are often incorrect anyway). The results are jealousy and envy which are often the culprits behind our dissatisfaction. Spouse, partner, family, house, job, looks, body, car. Money, holidays, rest, friends, food, things. Then I would be happy. Then I could feel thankful. It’s a vicious circle. It never ends! The dissatisfaction takes over, it eats away at our hearts. It blinds us til we no longer see what we do have, instead focusing our thoughts & even words on all we don’t. This dissatisfaction is often fueled by media, advertising, social media and looking at others lives around us. We are sold the lie that we will be happier if only we have more than we do now. When we can only see what we don’t have we will not be thankful for what we do have. We will also not be able to feel thankful for what others have when we consider them to have more than us. Instead we become consumed with envy and it destroys us from the inside out. I believe that thankfulness is one of the main keys to happiness. There is so much joy to be found in a grateful heart. Maybe we need to see our lives with more grateful eyes. We don’t need to wait until we lose something to embrace a more thankful perspective. We can choose to see things differently now. The last three months opened my eyes and helped me to develop a more thankful heart towards everyday life and those around me. I am very mindful of the fact that it is so easy for me to fall back into old habits and old ways of thinking as time goes on. How easy it is to forget lessons learned in the past. So I hope through writing this and my other blogs about what I have learned over the past three months, that I will be able to remind myself about remaining thankful. For each breath that I take. For the wonder and opportunity of each day. For friends, family and community. For the beauty of the world around me. For our beautiful home and food on the table. For provision in so many ways. For everyday life and even the ‘mundane’ aspects of it. (When you can’t have this you crave it. When you do have it you often crave something more exciting). And on those days when I start feeling fed up or sorry for myself: because the kids are playing up, the house is in a mess, I look dreadful, I have too much to do, things are breaking and I can only seem to see what I don’t have & can’t afford. I hope that I will quickly choose to remember, to shift my perspective back to a more grateful perspective and remember when getting through each day was all I could focus on. When health and normality were longed for and yet seemed so far away. When I just hoped to soon be well enough to able to get out of bed and walk outside on my own, so that I could fulfill some of the simple things in life like get the kids to and from school, get the dinner ready for my family and keep the house tidy. We have so much. Look around you and see with new eyes all the blessings in your life. A simple thought or act of gratitude will bring you so much happiness. 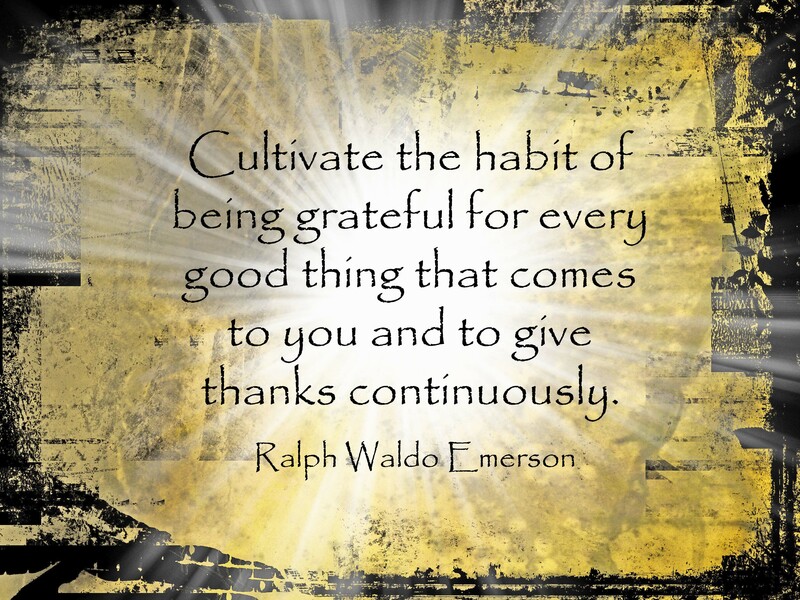 We can develop a habit of waking up each day and thinking about things we are thankful for. You may well find that your day starts better when it begins with gratitude. My injury and illness only lasted three months. Some people face bigger storms: a much more challenging health diagnosis, the death of a close family member, a marriage break down or they lose their job and can’t find another. So many different storms can shake our normality, but thankfulness always remains one of the best keys to finding the strength we need to push forward with a positive perspective. Try it! What can you be thankful for today? Who can you say thank you to? In my last blog post: Surviving the Storm I shared some of the story of the last 3 months of my life. During the post I wrote about the journey I had been on following a fall off a ladder which, for a while, left me with a debilitating brain & spinal fluid injury which stopped me in my tracks for a number of weeks. (And included a two and a half week stay in a local hospital). It was an immensely challenging time for us as a family. Suddenly I found myself lying in bed pretty much all day, for 10 weeks, and if I did get up, for a minimal amount of time (usually 10-30mins) I was so lightheaded, dizzy, uncomfortable & in pain that I couldn’t function normally and quickly had to return to bed. Even lying in bed I battled various unpleasant symptoms. My husband Matt, whose job can take him all over the country, as well as being one of the leaders at our local church, suddenly lost the day to day support of his wife (and our girls (age 8 & 10) mum) and had to take on many of my roles whilst coping with his own. Anyone who knows what a ‘full’ life we normally lead knows what a challenge that was for him. One to which he stepped up to and executed so well and calmly amidst a very challenging time. However, in this season one thing we knew early on is that we could not face this alone – without our daily life falling apart. We could not cope on our own. It’s a humbling process when you can no longer manage day to day life on your own. Having to ask for and accept help from others so that life can somehow keep moving forward each day. For this season we could no longer be the ones to offer help. Instead we had to accept others help daily. And that brings a new level of humility as well as a new level of gratefulness for family, friendship and community. of so many people around us that made our storm bearable. This combined with the inner strength and peace that came from our deep relationship with God allowed us to push through our weaknesses and somehow weather the storm. We are created and built to be together in family and community. We are built to show and share love even beyond our natural families. It is so sad that our western societies often place individualism over community. I believe that individualism is often a fruit of selfishness and self preservation and it robs us of the joys of true community. Our societies have lost so much community spirit and although various people attempt to revive it, it can be a challenging battle to fight. People are so busy with their own lives & families that we can easily loose a sense of community on a wider level. Although myself and my husband are big advocates of community; sharing our lives and journeying together through life with others through local church and in our general lives, the last three months revealed that even after years of advocating community we too could still be too self-sufficient, individualistic and prideful in our own thinking. How did we recognise this? Simply that we soon discovered that early on during my illness we didn’t find it easy that suddenly the roles reversed and so many people had to help us in so many ways. That we were the ones struggling, the ones in need of help and support. 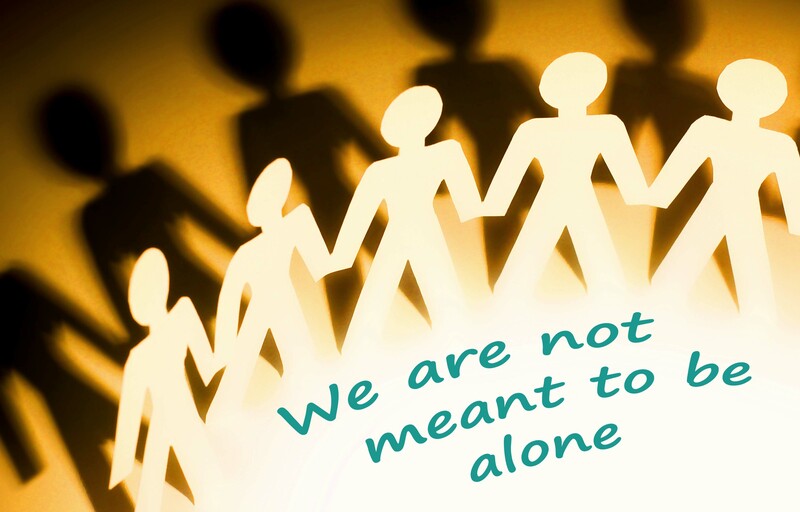 I realised that I was so used to being self-sufficient, getting on with life, facing challenges, keeping going and often the one helping others that it was a challenge when we became the ones that people rallied around to help and support. You can feel weak and helpless, a bit of a burden to people who are already so busy with their own lives and commitments. That you are letting others down by them having to find the extra time and energy to cover your roles. Matt and I are great advocates of grace and generosity. We believe in giving without expecting a return, loving whether or not someone is deserving and serving others without expecting anything back. We constantly do our best to teach and model all this within our church community. Why then can it be such a challenge for us to receive others help and generosity ourselves? Please don’t misunderstand me: we were utterly blessed by it. It touched us deeply to have so many people look after our children, get them to and from school, prepare us beautiful meals, shower us with flowers, cards and gifts, clean our house, step into our roles at work, church and school and offer up prayers and words of support. We were and are so very grateful and thankful for the support of so many wonderful friends and family. It was a lifeline at a very difficult time. However, I realised that sometimes we may not naturally allow others the joy of giving and helping us because of our own pride and self sufficiency that says we are OK and can manage, even when in reality we are struggling. This is often because we do not want to trouble other people and so we think we are helping them by not letting them share in our struggles. Thankfully in our case we have friends and family who know us well enough to know we needed help regardless. We hardly needed to ask because the offers came pouring in which was truly a God send and a wonderful blessing. However, we still learnt that people will not always have room to be the blessing they desire to be if we do not allow them into our weaknesses and struggles. One of the reasons we don’t always let people in is because it is not easy to be vulnerable. It is not easy for self sufficient people to be the ones in need. Perhaps many of us are too used to being individualistic and self sufficient. Maybe we are more a product of our western society than we first thought. I have realised that my own self sufficiency can actually get in the way of us building the community that I believe God created us to live in. And that community is not healthy until we begin to lay down our own self sufficiency and learn to both GIVE and to RECEIVE with grace and humility. When you are used to giving, it is not always easy to receive. On the reverse, some people are so used to being in need and receiving that they do not find it easy to give. Which is a challenge, because we need to be doing both for community to work. Our own individualism and pride can stop community working as it should, if we do not allow others to share in our STRUGGLES as well as our VICTORIES. Sometimes our hearts need to be exposed. Our weaknesses need to be seen. That we all need others. That we are not built to live life alone. That pride & self-sufficiency are the enemies of true community. That if we want to be part of a community that we need to let people into our lives – warts and all. The challenge of community is to become people who are open about our lives and will choose to both GIVE and RECEIVE graciously. The beauty of humanity is majestically displayed when we are loving & serving one another. For it is love that creates real community. At the heart of love is humility & generosity. And it is humility & generosity that breaks down pride, individualism and self sufficiency. Which, in turn, opens the way for true community. How can we allow others to share in our lives in a way that builds true community? Do you find it easier to give or to receive? 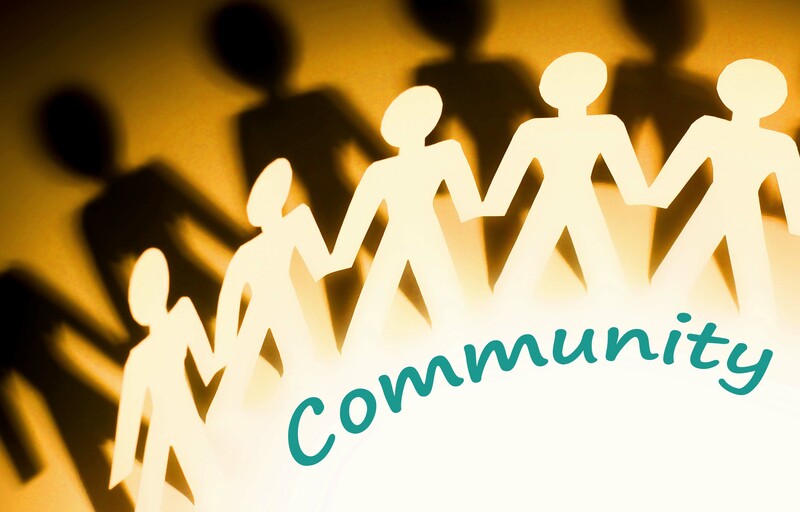 How can we embrace the humility needed to model healthy community to others? Community is not healthy until we begin to lay down our own self sufficiency and learn to both GIVE and to RECEIVE with grace and humility. 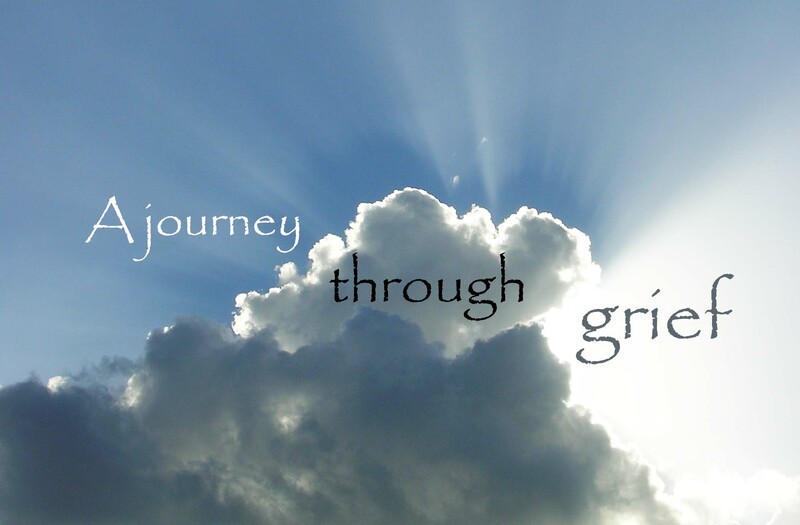 A Year Ago Today: A journey through grief and what I have learnt. A year ago today we sat in an ICU relatives room being told that today was the day that they would turn off my Mum’s life support. Those few days were a tough and exhausting journey. In November 2013 we discovered that she had a brain tumour. On January 8th 2014 the doctors operated on it. The operation was complex and took 14 hours. In their eyes it was a success. However, the next 48 hours proved fatal as it emerged that she also had an infection in her pacemaker that caused septicemia, and this combined with the brain surgery overwhelmed her already fragile body. Those few days opened my eyes. This was my first experience of ICU. There were critically ill people everywhere. Attached to machines keeping them alive. Many of whom would recover and yet many of whom would not make it or at least only ‘make it’ through to a life dramatically different from their previous one. And the waiting room was full of people waiting for them. But unlike most waiting, it was often waiting to see whether a loved one would live or die. Waiting to see what that life-changing injury, illness or surgery would do. What it would look like within their family. To say goodbye or to welcome someone back. And even if they came back, their life may be radically changed. And in that room it was different. A different perspective. An unsaid understanding that people were fighting a battle. That people were riding a storm. When you left that room and went out into the wider hospital or world outside, it was different. Staff at work. People visiting patients. A coming and going of life and normality….for some. But our experience was far from normal. There was a part of me thankful to have been there and seen it. To be there and remember & realise that while we go through our ‘normal’ lives, others are facing turmoil, crisis & pain. Sometimes it’s hidden away behind a door titled ICU in the middle of a hospital. Sometimes it’s in a hospice down the road. Sometimes in a house next door. Sometimes it’s hidden in the lives of those you work with, walk past, sit next to on the bus. The shop assistant, the teacher, the security guard, the single mum. People are hurting even though you may not know. We lost my Mum a year ago. A year ago I experienced my first real experience of personal grief, along with all the questions and thoughts that go through your mind. For the first few days & even weeks after it happened, I felt an anxiety & what was like a ‘fear’ I hadn’t felt before. The above quote from C.S. Lewis resonated with me. It’s a feeling like anxiety and fear and yet you are not actually afraid. A heaviness. A pain within. A pressure that builds up inside you and you don’t know what to do with it. The thought of going out and seeing people you know can be hard. A ‘fear’ grips you. An anxiety I had not felt before. I chose to push through, to fight, knowing that I couldn’t let those feelings debilitate me. I had to push through, to break through. To discover purpose through pain. To face the questions. To let go of guilt & embrace the way forward. The way out. The way that sees good triumph over evil. The way that does not allow death to destroy. I have learnt that the best way in life is not denial. It is to face challenges head on. Knowing that you will get battered through the journey. But knowing that taking a battering and coming through stronger is better than allowing yourself to be destroyed inside due to denial. So that is the journey I have walked. A journey that turns difficult things into challenges that make you stronger and wiser. A journey of self-awareness. A journey that helps you to feel more empathy & compassion for others. And a journey that becomes part of your identity, but that does not define who you become. Some great words that someone sent me at the time that really helped. So, one year on, I sit here and I remember the pain. I remember the exhaustion. I remember those days in hospital where my loving God was my only strength & the source of the deep peace I felt throughout. When words from the Bible, music & other inspiration carried me and become an anchor that held me tight. I remember the relief when my husband, Matt, was able to come to London a day after my Mum died. I remember the drive back to Leicester in the car: utterly spent, physically & emotionally exhausted and yet finally being able to share with my husband the full journey of the last few days. I remember when I got home. The desperate need to find a photo of my Mum looking healthy, so as to replace the image of someone who hardly looked human lying in that hospital bed. Grotesquely swollen from head to foot. Covered in wires. I remember the pain, the questions & things to work through in my mind. The tears. The memories. The exhaustion of sleep lost, of pushing through. But here we are a year on. Today marks the anniversary of that day. I have learnt that each person deals with and faces grief differently. There are few rights and wrongs. I have always felt grief was much easier for me than some. Partly, because I lived over 3 hours away from my parents. Our lives were no longer as intermingled as they were as I was growing up. I did not have to look daily at the empty chair. I was not reminded hourly, daily of the person lost. And perhaps because my relationship with her was quite complex anyway and had been for a long time. (Although that brings its own challenges into the grieving process). And yet I know that what gets me through this, and all the things we face, is an ability to see the positive amidst the negative. A training of the mind to face challenges head on & to learn and grow through them. An inner strength that comes from my deep relationship with God. An innate gratefulness that there are always blessings, hope & joys in life to be found – even amidst the pain of death. While we were in the ICU waiting room there was a couple waiting for their 20 year old son to wake up. He had been in an accident & was in a coma. They didn’t know if he would wake at all. in that hospital waiting room. They had been there about 10 days. They didn’t want to leave in case he woke up and they were not there. On that Friday afternoon my family sat with my Mum as they turned off her life-support. An agonising time which seems to go on forever as the heart continues to beat for a good few minutes after the breathing has stopped. And the heart rate goes up and down until finally, agonisingly slowly, dropping to zero. I tried to put music on my phone and hold it to my ear to drown out the beeps of the heart monitor that lie to you that a person who is gone is still there. However, as we left the ICU that day for the final time, I saw that couple we hardly knew still waiting for their son to wake. We had shared a connection. We had shared the pain of watching a loved one in the throes of death. And as I looked up at that mother she immediately knew what had happened. In that significant moment, someone I hardly knew hugged me. With a touch that I needed. A touch that understood and felt the pain. And I whispered to her, with all the strength I could muster “I really do hope things are different for you.” She replied with deep gratitude and briefly shared how touched she was for someone to say that in the midst of their own pain. I will never know what happened to that family. But I do hope things went well for them. Never let your pain define you. Never become so consumed with yourself that you cannot feel another’s pain. Instead allow your heart to become tender. Allow yourself to reach out to others amidst your own struggles & vulnerabilities. Everyone you meet is facing some kind of battle. Some are having to fight harder than others at that moment. The beauty of humanity is that suffering can, if we let it, unite and draw us together in a way that nothing else can. It strips us of our titles and crafted exteriors and touches the heart. It has the power to break through masks, if we let it, because it touches who we really are. Because it is then we realise that we are ALL just fragile humans. It is then we realise that we are ALL more similar than maybe we thought. It is then we know that we ALL face challenges and we ALL feel pain. So let’s choose to journey through life with compassion and care. Understanding that we are not dissimilar. We do not need to fight one another. Instead we can support one another and choose to ‘hold’ one another even in the midst of our own pain. Suffering can, if we let it, unite and draw us together in a way that nothing else can. It strips us of our titles and crafted exteriors and touches the heart.